There were huge numbers of gulls at the Patch again today but still no real change with the two Iceland Gulls and also two Mediterranean Gulls still present. The first hour of daylight saw over 100 Red-throated Divers, a Great Skua and 500 auks move east. The most significant records today though involved two flocks of White-fronted Geese totaling 146 birds which flew over the area. Four Goldcrests were seen in the trapping area. The Observatory has recently published its Annual Report for 2015. 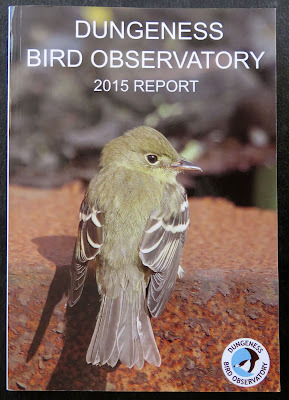 In addition to the usual contents it also contains accounts of the first British record of Acadian Flycatcher and the discovery of breeding populations of Tree Crickets and Sickle-bearing Bush Crickets. It is excellent value at just £8 (£1.25 for postage).